As the hunt for colleges begin, you realize it’s not an easy job to finalize colleges and more so in the science stream as there are just so many colleges to choose from. and to select a college that fits you best becomes a daunting task. Further most of these colleges offer courses at a very high fees. 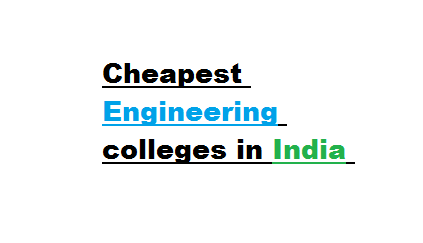 Here we have some of the cheapest private engineering colleges and B-Tech colleges with low fees to make you more informed about the options you have so you can choose wisely. The college is located in the NCR belt in Haryana Panipat.The college is equipped with all facilities and also houses a hostel for students. Wi-Fi enables campus which is a must in today’s world and has also got Air conditioned classrooms. Courses offered by this prestigious college include these BTECH M TECH, BBA and many more. Robo rally in technology fest. The college offers various courses like B.E, M.E, M.B.A and many more. The university won the award for Education Leader of the Year Award 2013.